Gartwo's Main Event-More fun than a stroll down Badstreet! buttons and 7 joysticks I couldn't figure out how to do much of anything, except get so aggravated that I left. 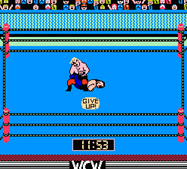 This experience got me to thinking about the good ol' days of video gaming, and I thought i'd take a while to play and write about some of my favorite old wrestling games, starting with World Championship Wrestling for the NES. 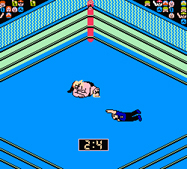 --------This was the first wrestling Nintendo game my brother and I ever got. I was always a WWF fan first and a WCW fan second, so that made this game seem a little less special to me back then. If it didn't have Hulk and the Ultimate Warrior on it, it wasn't much of a game to me. 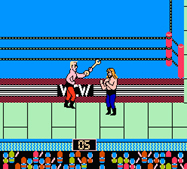 But now when I play it I think it's probably the best wrestling game ever for the old NES. There are 12 wrestlers to choose from: Sting, Lex Luger, Ric Flair, The Road Warriors, Rick Steiner, Mike Rotunda, Ricky Steamboat, Eddie Gilbert, Kevin Sullivan, Michael PS Hayes & Steve Williams. 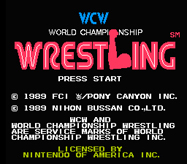 By the time we got this game at Christmas 1990 over half of the wrestlers on it weren't even in WCW anymore. Nevertheless, we played the heck out of it. This game meets the two main requirements to be a "Gartwo Certified" great game, it's easy to play & it's fun. Not like these new high-tech wrestling games in which you have to study a lousy player's guide full of diagrams, charts and seemingly endless button combinations in order to play them. Each wrestler on WCW has his own unique move list from which you got to pick four moves to use before each of your matches. During the match you could throw your foe outside and bash his face in with a wrench that just happens to be lying around. Each time you excecute one of your moves on someone, you power bar gets a little higher. When it gets to a certain height, you can then put in your dreaded specialty move, like Sting's Scorpion Death Lock, seen above applied to Animal. The object of the game on one-player mode is, of course, to win the World Title and I was determined to get back to the top of the mountain one more time! After all, if Hogan can come back in the year 2002 and win the WWF title, surely I can make a triumphant return to the WCW Video Game and relive my past glory once more. But first I had to actually get the stupid Nintendo to work, which required a lot patience...and hitting. About a half hour later, that old familiar title screen finally showed up and I, as The Stinger, was set to go kick some 8-bit tail. 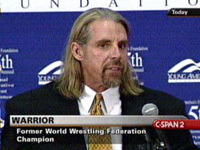 My first opponent was Freebird Michael P.S. Hayes and I quickly found out that my old Nintendo joints aren't what the used to be. This game requires a lot of rapid button pushing and my thumbs were worn out by match two. So I decided to take the easy road to the top and hook up the bad mother known as the "NES Advantage". For those who don't know, it's a big joystick type controller with Turbo controls on it, so instead of repeatedly pushing the buttons over and over, I can simply hold them down. Call it cheating if you must but I wasn't there to fool around, I was there to win. I steamrolled through the first 8 matches but met stiff competition in one Ricky "The Dragon" Steamboat. Ricky Steamboat piledrives Gartwo, as Sting, in an epic encounter. Hey ! If you'd like to relive some old memories, or play these great games for the first time, but you don't have an old Nintendo, try downloading an emulator! With an emulator you can download and play practically any old video game you'd like, right on your PC! Just search around the net for emulators (I use Jnes) & roms, find a good site, download the proper files and play like it's the 80's all over again. Keep in mind, though that downloading copies of video games you don't actually own isn't the most legal thing to do, so you didn't hear it from me...wink, wink! 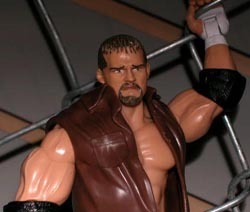 Jamie Noble has been to my House...really. The pros & cons of President Warrior.